It’s 500 years old. Written in 1513 in Italy by Niccolo Machiavelli, this book was not at all what I expected. First is its size. The entire book including the dedication is only 73 pages long. I honestly thought I had indavertantly bought the abridged version. But, more surprising than the size, was the content. The author’s name as become an adjective. If someone is Machiavellian they are cunning, deivious, unscrupulous. Not someone to be trusted. I expected the book to be a medieval version of the Anarchist Bible. It’s not. The prince referred to in the title, is not Machiavelli. This was another surprise. The title is directed at both an indiviual, and a class. The author is trying to advise Lorenzo Di Piero de’ Medici on how to build up his own kingdom and hopefully unite all of Italy under a single rule. (Preferably, that of Medici.) 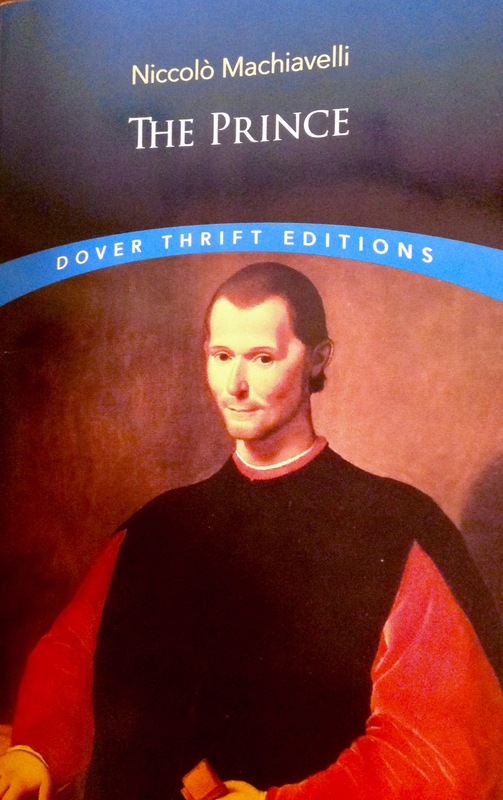 Machiavelli also uses the title of “prince” to describe any leader of a state. He uses the title equally to refer to kings, emperors, popes and presidents. Men are either to be kindly treated, or utterly crushed. But, the surprising thing is Machiavelli’s utter rejection of those who are. . .well for a better term, Machiavellian. In a chapter titled “Of Those Who By Their Crimes Come To Be Princes” he utterly rejects to stereotypical conniving brutal monarch. Still, to slaughter fellow-citizens, to betray friends, to be devoid of honour, pity, and religion, cannot be counted as merits, for these are means which may lead to power, but which confer no glory. At this point in the book I was convinced that the world had misunderstood the good Italian, and then, I read the next line. It is not essential, then, that the Prince should have all the good qualities which I have enumerated above, but it is most essential that he shoudl seem to have them. I will even venture to affirm that if he has and invariably practises them all, they are hurtful, wheras the appearance of having them is useful. The key is to know how to “change to the contrary.” Machiavelli deserves his reputation after all. Still, I found the book fascinating. The writing style was surprisingly easy to read for a five century old text. Many of the examples were easy to relate to 21st century political events. Machiavelli used examples from throughout history including Alexander the Great, Moses and many others to illustrate his points. Much of his advice can be applied at a business level and even a personal level. Mixed in with the examples that have survived history are many more that did not. Machiavelli, writing for a contemporary audience cites “local” princes that his intended audience obviously is familiar with. As a modern reader, you pretty much just have to skip over those passages, unless you happen to be intimately familiar with 16th Century Italian political alliances. And, of course, much of Machiavelli’s advice is abhorant to moral people, both ancient and modern. His easy advocasy of situational ethics, while easy to identify in modern politicians is none the less contemptable. No, I do not want a leader who only appears to be honest and knows when to abandon his moral principles for political gain. If you enjoy the study of political science, “The Prince” is enjoyable as virtually an original document to describe the discipline. If you have to work in an environment where political machinations are a fact of life, it can’t hurt to get some historical perspective on the practice. And, at the very least, placing a copy of “The Prince” on your bookshelf at work is going to send a message to anyone who happens to scan your collected titles. Four out of four stars. Who am I to disagree with 500 years of literary success?